Indian masterchef recently released two videos, which prove that he isn't just a kitchen rockstar. The beautiful weather during monsoons demands a piping bowl of soup for comfort. Chef @SanjeevKapoor features in campaign, aimed at raising awareness about quality of spices. Chef Sanjeev Kapoor visited Israel last month and also attended the Indian culinary week. 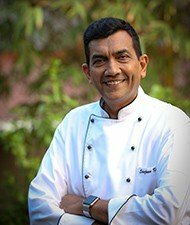 The Yellow Chilli, Oman is hosting a month-long mango fest with Chef Sanjeev Kapoor. Soon JNV schools would savour cuisine designed by Grand Master Celebrity Chef Sanjeev Kapoor.